Keiren Westwood is in the business of denying opposition strikers and this weekend’s Championship match against Reading will be no different for the Sheffield Wednesday man. The goalkeeper will look to build on the Owls’ record of four clean sheets in seven when he faces up against a Reading side desperately in need of a win as they struggle at the bottom of the league table. But it is up, rather than down, that the Republic of Ireland international is looking as Wednesday hope to draw inspiration from Yorkshire rivals Hull City and mount a late bid for the play-offs. “It’s going to be tough, but you never know,” Westwood said. “Hull are flying and they came out of nowhere. “You just have to keep winning, we can’t afford too many defeats if we are even going to challenge. 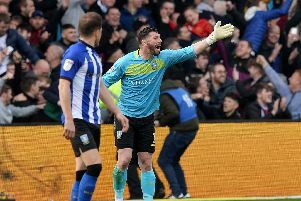 Westwood returned to the first team following the departure of Jos Luhukay over the festive period, and the Owls shot stopper has more clean sheets in his sights for the remainder of the campaign. “It’s gone well, but long may it continue. We can’t get carried away with seven games, we have to do it over the next 17 games. Although Westwood’s season didn’t start until his return to the Owls first team against Preston under caretaker manager Lee Bullen, his memories of the game are fond ones. “It worked out great, we won 1-0, and the reception from the fans was great. I can’t thank them enough for that. “It’s been really positive since I came back in, and not just me, George Boyd and Sam Hutchinson too. It feels like three new signings, because we haven’t been around. “It’s always been great, even when I wasn’t playing, I have never been one to blame another goalkeeper.